All archers know that the kind of bow they use is important to how they will be able to shoot. A good quality bow will help the beginner gain confidence whether on the range or out hunting, and a bow that’s easier to use will keep the archer coming back and practicing more. By purchasing a quality bow you can guarantee more fun shooting it and less time fiddling with getting the settings right and getting the bow to shoot straight. This Diamond Archery Infinite Edge bow is a great quality bow that will help you gain confidence will shooting. Don’t buy into a bow that won’t grow with you, make a good choice and you will be using it for years to come! This bow has an easily adjustable draw length for archers who are able to shoot with a longer draw. When you purchase it you will receive the bow, a sight, arrow rest, tube peep sight, a quiver, comfort wrist sling, BCY string loop, and a 5″ stabilizer. Along with some arrows you will be shooting your new bow soon after you get it. The bow also has a setting for infinite draw. With the adjustable draw weight you should be able to easily customize your shooting experience. Some pros of the Diamond Archery Infinite Edge bow include the adjustable draw weight and length. With a draw weight from 5 to 70 pounds and a draw length up to 31 inches, you can easily set this bow for a beginner or someone bigger and stronger who has been shooting for a long time. The FPS can get up to 310+, plenty to be able to bring down an animal if this bow is used for hunting. Another pro is that the bow is ready to shoot out of the box. There’s no putting it together or struggling with making sure pieces are in the right place. Simply pull it out and have fun shooting. There are a few cons to the Diamond Archery Infinite Edge bow. The factory strings on the bow don’t seem to be of the highest quality and will eventually have to be replaced. For the avid shooter this can cause a big of a frustration, although the casual archer may not notice or have a problem for a while. Another con with this bow is that some of the cams may not be as sturdy as they should be. Again, this can be repaired by a professional, but is not something you want to deal with when handling your new bow. Most of the online reviews of this bow are glowing. It seems to be a wonderful choice for a beginner bow and has the ability to grow with the archer for years to come. With higher quality strings and some good arrows most people achieve a good level of success when shooting with this bow. The quality of this bow appears to be very high, and the quiver and other accessories are decent as well. Of course, always check with a retailer regarding warranty information if you have concerns. 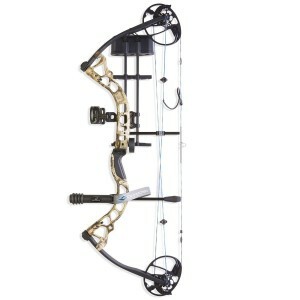 This bow really does seem like a wise choice if you are interested in shooting a compound bow. The fact that you can shoot it right out of the box is a huge plus for those of us who don’t yet have the full understanding of different parts of a compound bow. The adjustable draw weight and length mean that you won’t have to replace it for a while. You can make sure that it grows with you as you get bigger and stronger, and that’s a huge positive in its favor.